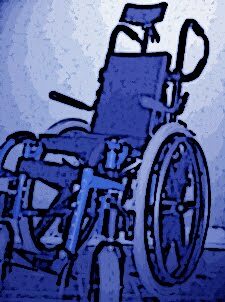 There's a Quickie® Zippie Lite™ wheelchair parked in our living room. It has a bright blue frame, lots of cool customizations - like handlebars that can be turned upwards for the comfort of a tall driver or downwards for a short driver, an eating tray that attaches to the armrests with Velcro, indoor or outdoor wheels, etc. It's a great little chair - incredibly useful for my son, Eidan (7yo, autism diagnosis w/ hypotonia, etc.). He likes to climb into it, to see life from his height, with ease and safety - no threat of falling over or running into something. As awesome as it is, I have repeatedly turned against Zippie. I remember thinking of how to re frame Zippie as a kinetic sculpture. It was a turbulent relationship I've had with Zippie the Inanimate Object for the three years that it has lived with us. At first, it was love: the new smooth ride, a way that Eidan might be able to get himself around, a therapy tool. It could even serve as a portable eating station. Other side: a visual label people could use to package their view of my son, without speaking to him, something looked away from, a crutch. My struggle was over this: Zippie is a reminder of what my son can't do yet. The dark wheels turned as I judged myself for my dislike of Zippie, simultaneously seeing the flaw in my logic, and understanding Zippie's usefulness. I judged myself for not changing my beliefs, knowing I could choose happiness with Zippie the Stimulus. I judged myself because I didn't "run towards" my discomfort about Zippie. I scolded myself for actively choosing not to look at my beliefs. Explorer: "I hate putting Eidan in his wheelchair. I'd rather carry him anywhere than put him in that thing." Mentor: "Why do you call it 'that thing'?" Explorer: "Because I hate it. I want to get rid of it. Eidan's not going to need it soon, anyway." Mentor: "Why do you hate it?" Explorer:"I want so badly for Eidan to walk steadily enough and comfortably enough to not need it - I'm using the chair as a scapegoat. It's good to have - I know that. Not everyone can pick Eidan up easily." Mentor: "Why are you using it as a scapegoat?" Explorer: "Because I'm not comfortable with my son's physical limitations and there's nothing to blame. I want to be like the mom of the Olympic runner, born with polio, who had her legs rubbed back to life. Believing in the most wonderful possibility and acting towards it, not focusing on how that possibility hasn't transpired." I soon discovered that I was using the wheelchair to deflect my feelings of not doing enough for my son to support his physical development. Without using the Option Process® Dialogue to explore and be clear about my beliefs about Zippie - and discontinue the endless cycle of my uncomfortable responses, I would still want to watch Zippie burst apart as pieces of metal piping and bolts from atop a cliff. I have seen many times now for myself that not exploring my beliefs, to just push away the realizations like "Hey, what's my beef with Zippie?" is like putting up stop signs on my path of personal growth. Stepping out of the Option Process is turning away from myself. If I choose that groove of turning away from myself, there's no movement. Zippie and I are pretty tight now, and so are Zippie and Eidan. Eidan has learned how to move around in it a little, which is a lovely new ability. I am simply grateful now for all the ways that Zippie supports Eidan. And there's no awkwardness about the past - we both tend to move forward easily. The Option Process Dialogue is such an effective tool for self-studentship leading to change. It's wonderful to see myself and my friends who are Option Process students and/or Son-Rise Program parents evolving, becoming happier, healthier, inspired by their lives, forever changed. You want to learn more about the Option Process Dialogue? Cool! Go for what you want! The Option Institute is available to you with many programs that will teach you the Option Process Dialogue. And if you want to stay home Power Dialogues and other books by Barry "Bears" Neil Kaufman are just clicks or screen-taps away.